In our society, we have people doing the most important work to keep us healthy such as farmers, doctors, and caretakers. They are among those who provide the basic needs that allow us to come up to the line of subsistence. Then, we have people who are engaged in enhancing the quality of life above that line, such as artists, entertainers, and chefs. I have spent my life dedicated to the latter, working alongside people whose aim is to add to the available beauty. Many see art and entertainment as distinctly human; in fact, some might argue that they are among the qualities that define humanity. I would like to see that change. I have made it my vocation to bring music to other species, and now I am adding my voice to the growing choir of people who recognize that animals are capable of appreciating beauty, as long as that beauty is specifically designed for each species. Of course, species-specific art is the only art we have ever seen. Like all other forms of art, it was made by humans for humans. We don’t paint in colors that we can’t see. Why Do We Exclude Animals? 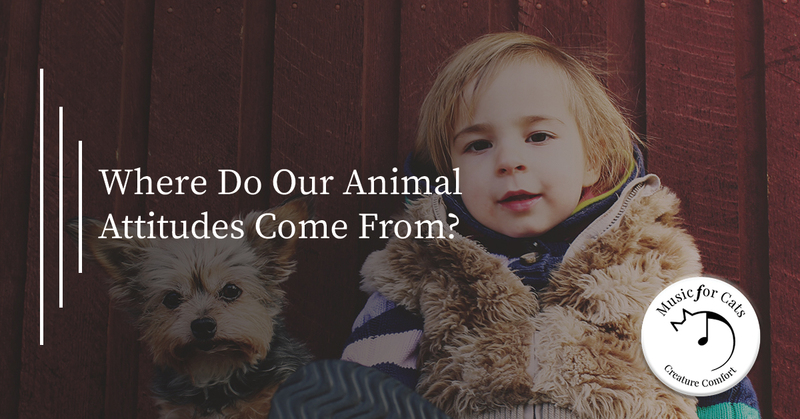 Why do we, as humans, seem to be predisposed to assume that animals cannot think or feel? When something so obvious is so consistently dismissed, it will be good to look at whether or not there may be an evolutionary reason for the barrier to the understanding. Are we born predisposed to lack empathy for critters? If you are a good skeptic (is there any other kind?—“good skeptic” seems redundant to me), you probably question the idea that beliefs can be carried in our genes. Well, have you ever wondered about how easily we separate people between “us” and “them?” Every culture and civilization have the “us” members and the “them” non-members. The rules of engagement are opposites for each. Giving comfort to one of “us” is highly praised, giving comfort to the enemy—“them”—is treason. Killing one of us is bad, killing one of the enemies is good. It seems to me that, if this can be found everywhere in nearly every culture, then it is probably built into our nature. That is not to say that we should not rise above our nature that has evolved to benefit our hunting/foraging ancestors. I believe that we should supplant instinctive traits that no longer benefit people living in today’s societies. Surely, one of the reasons that people tend to dismiss the idea that animals have emotions is because each of us views our own emotions as our very selves. This is what I think, but that is also what I feel in my gut. Going with that is personal and individual. “I love her. I don’t know why; I just do.” That kind of statement is a statement that defines your inner self. I can think “2×2=4” and so can you, but a feeling…that’s personal. Definingly personal. When we are close to loved ones, we empathize with them and are capable of feeling what they feel. The stronger the connection, the more we feel with them. Evolution has dealt us different empathy cards for different people. The closer the circle of friends and family, the more empathy we have for them. Circles of people who are further from us get fewer empathy cards. Enemies get the anti-empathy cards. Now, let’s consider animals. Humans tend to eat them. If we have too much empathy for animals, we will be less likely to eat—meaning we are less likely to survive. Of course, that default setting was placed in us by evolution as hunter-gatherers. Since the survival issue is no longer valid, the default setting of lack of empathy for animals is also no longer beneficial. Some of us believe that it’s time to change that. It’s time to use our extraordinary adaptability to reprogram ourselves. Arguably, people feel the strongest emotions towards their pets. For many, this is their cat! We are delighted to present a natural calming for cats: music designed specifically for their ears. At Music for Cats, we believe in creating beauty for all species, not just our own. Through scientific research and thorough understanding of what sounds cats appreciate and react to, we have created music that will intrigue and soothe your cat. Order your CD today and see the difference yourself!